Accueil > Pages perso > Sturm Frédéric > Quelques résultats en image ! 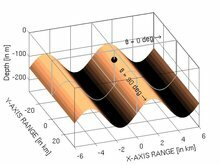 Sound wave propagation in a three-dimensional oceanic waveguide with a sinusoidal (corrugated) bottom. The 25-Hz CW point source is omnidirectional (source depth of 40 m). Numerical simulations performed using the 3-D parabolic equation based model 3DWAPE. Horizontal slices (at a constant depth of 30 m) of the transmission loss field (in dB re 1 m) corresponding to pseudo 3-D (upper subplot) and fully 3-D (lower subplot) PE calculations. Vertical slices (at a constant azimuth of 90 deg) of the transmission loss field (in dB re 1 m) corresponding to 2-D (upper subplot) and fully 3-D (lower subplot) PE calculations.